New research from RED C Research in conjunction with their partners at WIN/Gallup International across Europe, has found that despite the UK voting to start the process to leave the EU in June 2016, Ireland remains one of most pro-European countries in Europe. 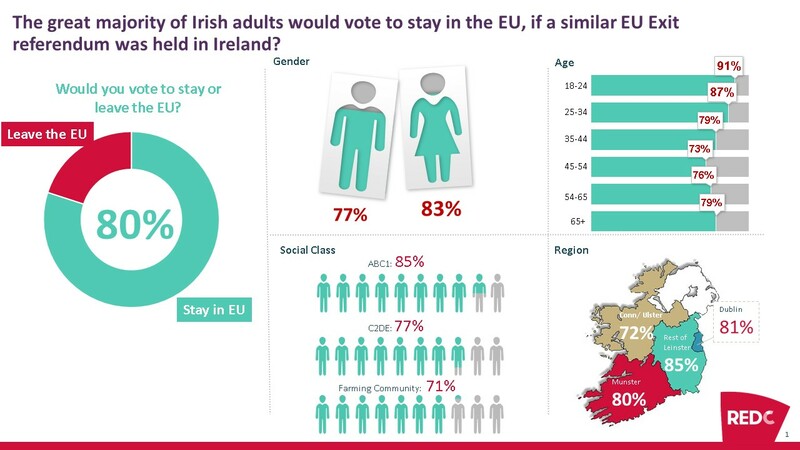 When asked how they would vote if their was referendum on membership of the European union, 80% of Irish citizens suggest the would vote to remain in the EU, slightly higher than recorded in 2015. The EU appears to be relatively secure elsewhere in Europe as well, as the percentage of people in Germany, France and Belgium who would vote to leave has fallen from 12 months ago; those in Denmark and Sweden are also significantly less likely to vote to leave compared with a year ago. However, there has been a significant increase in support to leave the EU in Finland (up from 29% to 40%) and in Greece (up from 38% to 46%). The large increase in support for leaving seen in Italy last year has been maintained in 2016 with 40% (down from 42%) preferring to leave. When the study asked those in the UK how they would vote in a second referendum 54% said they would prefer to be a part of the EU and 46% preferring to remain out (down from the 54% recorded in our poll 12 months ago). Along with Ireland, the Spanish (with 20% voting to leave) are the most pro EU of those polled. While Ireland has spent 2016 getting used to a new politics, the people certainly appear to believe it is working. By some distance the Irish are the most likely to state they feel the country is moving in the right direction. Our survey reveals 62% of the Irish public believe the country is heading in the right direction. The next most optimistic country is Iceland (57%). However for most in Europe, the view is that their countries are heading in the wrong direction, most noticeably in Greece (89%), France (82%) and Italy (79%). Q If there was a referendum tomorrow in your country on whether (COUNTRY) should remain a part of the European Union, would you vote to stay in the European Union or to leave the European Union? *Since Iceland is not a member the question asked whether they would join if given a vote. 65% said they would prefer to stay outside the EU. Q In general do you think that things in your country are heading in the right direction or the wrong direction?